Feel like diving into the waters and taking breathtaking tours, seeing the ocean at its best, and enjoying the aquatic views? Join us at the Umm Suqeeim Fishing Harbor today. Our team is on standby to welcome all visitors and introduce them to the group. We have certified instructors for both sports. 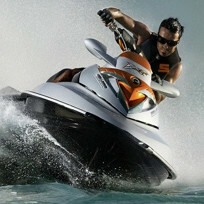 For Jet Skiers, after you’re given your own Jet Ski, you’ll also be provided with your own certified instructor. 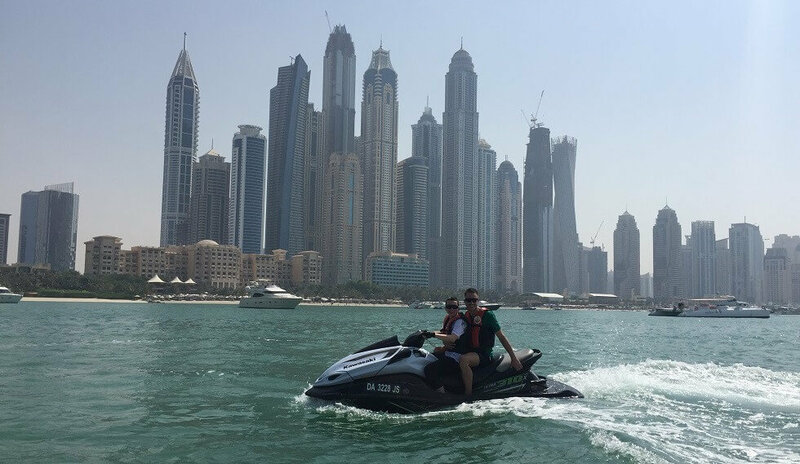 You take control of the Jet Ski while the instructor takes control of the routes while giving you useful advice and tips throughout the tour. Ensure to ask about controls that you don’t understand or views you find exciting. For the latter, your instructor will inform you about the hottest spots along the routes and you’re allowed to stop severally to get a closer view. Stopping is also encouraged as it gives you time to rest, take fluids, and re-energize. For Fly Boarders, the instructor is mainly there to help you set the right power. Otherwise, you take the dives on your own and enjoy the splashing waters as much as you like. The experience can be one of a kind. So, try to remain attentive throughout the journey. Some people prefer to listen to cool music while fly-boarding. If so, the instructor will provide you with a headset for your helmet. You’ll also get advice on how to stay safe whenever strong waves approach and tips on thrilling stunts you can attempt. Remember not to try moves that you’ve not discussed with the instructor. 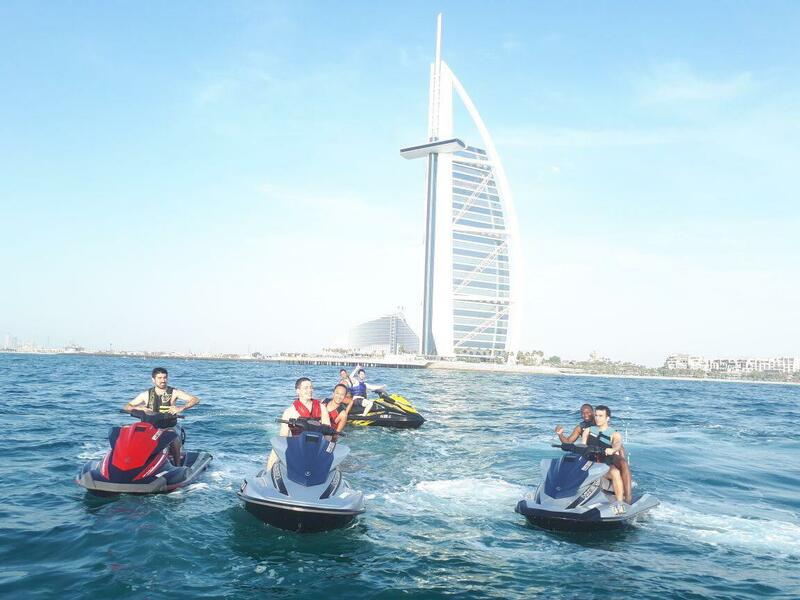 With MxDubai You’ll be able to jet-ski to the Burj Al Arab, into the Dubai Marina, and around the famous Plam Jumeirah. 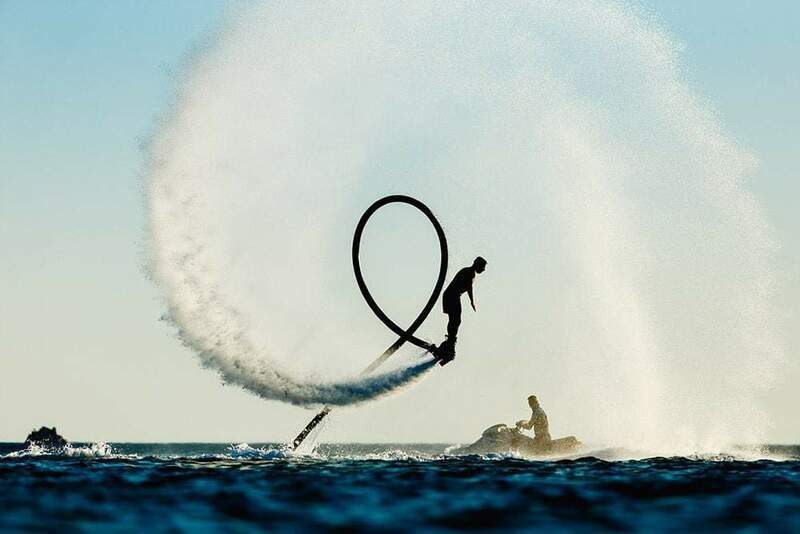 Fly board water sport is the newest action adventure in the Dubai! A fly board is essentially a standing board attached to a jet ski. The one-hour Jet Ski tour is as follows. First, you’re provided with your own Jet Ski with the instructor riding a different Jet Ski. Then you set off into the waters. The first stop is the Burg Al Arab, a 7-start hotel and one of the biggest hotels in Dubai. You’ll stop there for a photo shoot session. Ask your instructor to recommend the best photo spots around the hotel. Once you’re done with the photos, the journey continues to the east coast. Here you’ll enjoy the magnificent views of the Dubai skyline especially as you approach His Highness Sheikh Mohamed Bin Rashid Al Maktoum’s Island. If you’re lucky (which happens quite a lot), you’ll see his yatch parked on the island. Feel free to ask for photos. The tour then proceeds to the final destination, the Jumeirah Beach Residence (JBR). Here too, you can take as many photos as you want. Once you’ve had enough fun, you and the instructor return to the marina carrying plenty of souvenirs. The two-hour guided tour is actually almost similar to the one-hour tour, except that you get to interact with some of the spots for an even more satisfying experience. You’ll be provided with a jet-ski as usual. You’re required to ride the jet-ski on your own with guidance from our certified instructors. The certified instructor leads the way and you follow. The first stop is the 7-star Burj Al Arab Hotel. You’ll stop there for some time as you take photos. Among the photos will be one with an emblem of Dubai in the background. You then spend a bit of time viewing the skyline as you ride toward His Highness Sheikh Mohamed bin Rashid Island. You should find his yatch there – a magnificent work of art and one of the five best yatches the world over. From there, the journey heads to a beach in front of the Jumeirah Beach Residence where you’ll take a break. This is break is meant to allow you to take more photos as you rehydrate and grab something to bite. You can leave your jet ski on the beach while you do all these. Feel free to take as many photos as you wish in as many spots as you can find. For most people, these photos serve as a lifetime memory of the beauties of Dubai and an unforgettable adventure at the JBR. 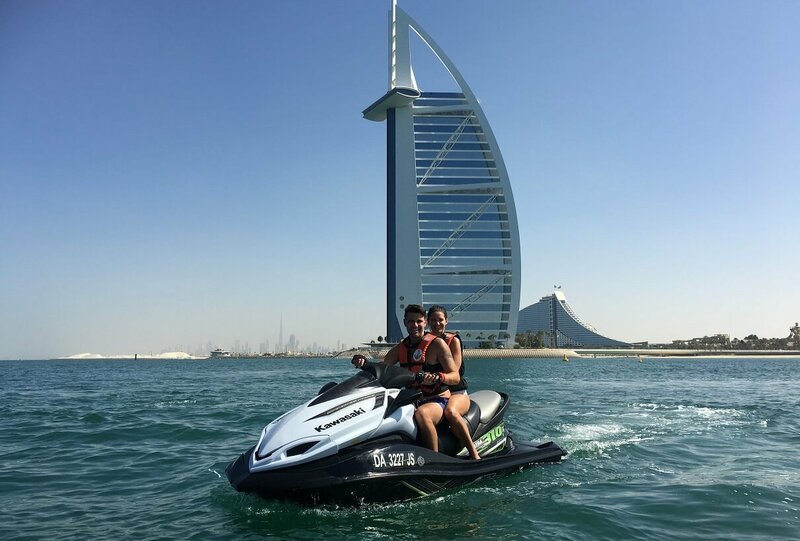 After the JBR beach break, you ride all the way to the top of the Palm Jumeirah and stop at the Atlantis Hotel for another photo session. Then, you ride back to the marina and ride with the BurjKhalifa in front. The ride with the BurjKhalifa marks the end of a two-hour tour. It’s usually an activity packed tour with plenty to see and love. The waters and skies make for a breathtaking view and the photo spots are carefully selected to give you lasting memories. Surf the sky ! Swim like a dolphin in Dubai with the Burj Al Arab in background and the Burj Khalifa in sight! You get to meet other enthusiasts of the sport and enjoy the thrills of gushing waves and tides. The arrangement lets you fly, Iron man Style! The best part about our sessions is that each guest has an instructor to help you stay safe throughout. We know that the high adrenaline can tempt you to try a few tricks. Some of these tricks aren’t always safe. Yes, you may not suffer any injures, but the moment you try a stunt off the books, you’re putting yourself at risk. Our certified guides are always there to ensure that you enjoy the sessions without exposing yourself to any risks.